In this book the emphasis is on mental calculation, mainly mental multiplication, but addition, subtraction and division are also covered. 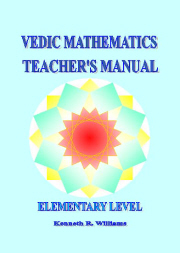 Each chapter focuses on one Vedic formula and shows various ways in which it can be used. There is a detailed introduction outlining the benefits of mental mathematics. In the book, The Natural Calculator, the author shows how natural processes of the mind are associated with mental calculation. Since multiplication operation reveals remarkably the properties of number, the book deals mainly with it. Prodigies are recognised by their ability to give instantly products of large numbers. The book is so written that it can be gone through, in any desired sequence. Algebraic proofs justifying the approaches are given at the end of the book. Problem-solving skills get a boost. The objective is to show how reliance on the calculator is harmful, as it deprives the mind from exercising its capabilities which get frozen through repetitive endeavour. Major part of mathematics education can be directed to give one-line response to basic operations, singly or combined. The experience is exhilarating and delightful, once one gets settled in the Vedic way. Availability of choice and the judgement that it entails provides one with expertise to shun routineness, the bane of curricular learning today. As Tirthaji affirms, there is flexibility, innovativeness and creativity in mathematical computation and this brings mathematics to life. The criteria for looking upon an activity as natural are spelled out by advent of increasing speed and accuracy. To put it in other words, calculation requiring pencil and paper is objective and external, whereas when resorted to mentally is subjective and internal and as vouchsafed by transcendental meditation is deeper. Instructional standards today centre round general methods but Vedic mathematics emphasises that every problem is unique with its own singularly arrived at solution. To ignore this tantamounts to underestimating children's capabilities to hold and remember. There are nine chapters, each of which is flagged with a bordered version of the experiences in brief of child prodigies who during the last four centuries exhibited extraordinary powers of mental calculation and baffled the audiences. Some of them blossomed into professors of mathematics like Aitken. The book is presented in prescribable format with models and exercises for practice with answers given at the end. It closes with general exercises with hints for two sections. A list of references is also provided. Vedic Mathematics was rediscovered from ancient Sanskrit texts earlier this century by Bharati Krsna Tirthaji (1884-1960). He found that all problems in pure and applied mathematics can be solved easily with the aid of sixteen simple Sutras, or word-formulae: for example All From 9 and the Last From 10 or Vertically and Crosswise. This may sound incredible but the Vedic system offers a very different approach to mathematics that is both powerful and fun. The Vedic system is so easy it is really a system of mental mathematics. It has a coherence and beauty that make it very attractive and some of the methods are truly amazing in their efficiency and simplicity. Many schools now teach Vedic Mathematics and a common response from children is: "Why were we not shown this before?". The Natural Calculator introduces this system; dealing with mental mathematics it covers various types of multiplication, addition, subtraction and division.